If you’re thinking about proposing, that’s the first question you’re going to get from friends and family. Chances are, you have some ideas – perhaps a location or some thoughts on a ring. Here’s the thing: no matter how much – or how little – thought you’ve put into your proposal, there’s a lot of pressure to get everything just right. You only get to do this once (hopefully), so how do you figure out how to do it? How do you arrive at the perfect combination of profound, meaningful, and intimate gestures? And do it all within your budget? If it sounds intimidating, that’s because it is. Making things even more challenging are many, many cultural traditions we seem to pick up from each passing decade. The 1930s saw the birth of the modern diamond engagement ring. The ’80s brought us stadium jumbotron proposals (interestingly, these are traced back to Ahmad Rashad’s proposal to actress Phylicia Ayers-Allen during a 1985 NFL telecast.) The 2000s saw an explosion in destination proposals and the birth of TLC’s Perfect Proposal reality series. Then there’s the social expectations: Your engagement should be carefully planned but spontaneous. Respectful but fresh. Centered in your relationship but also perfectly photo-worthy. And of course, everybody’s got an opinion. Anyone who’s ever proposed thinks their way is the best way and they’d love to tell you about it. You could go broke and crazy trying to do everything you should do… and still not get it right. Here’s the thing: you don’t have to do any of it. Forget What You Should Do… What Do You Want? Deciding what’s right for you and your special human means considering all the traditions, options, and ideas and then arriving at something that’s right for you both. Think of all the “shoulds” like a tasting menu – not a recipe. That’s why we’ve put together this fast guide to the biggest questions you should be asking before you pop THE question. It isn’t meant to be authoritative. Instead, think of this like a brainstorming session: it can help you figure out what you want from your proposal, what your partner wants, and just as important: what you don’t want. Strap in: we’re about to question everything you thought you knew about proposing. We met in Haiti while I was filming a documentary and she was volunteering as part of her med school residency. About a year in she was like, “What are we doing here, pal?” we had the The Talk. We never discussed the engagement but we both knew we were going to get married. I had two plans. Plan A: I was going to ask her to marry me on the finish line of the Boston Marathon and use a piece of my shoelace for the ring. Her dad was running with us and I was going to discreetly ask his blessing around mile 14 or 15, but they were too fast for me. They ditched me around mile 20 and I scrapped that plan. Plan B: I always have a camera rolling, for work or life, so I took all the footage from the first year of our relationship and made a short video. We had a hike in Berkshires coming up and I was going to bring an iPad and play the video in the tent at night. A few days before the hike, I asked her dad’s blessing (which he gave) and I just couldn’t wait. That night I pretended we were going to watch an episode of Breaking Bad and played the video. The last frame was the question, “Will you marry me?” We got engaged a year to the day after we met. I didn’t get down on one knee. I didn’t have a ring. It didn’t matter to us at all. She was a resident with med school debt and I was a struggling filmmaker. I cared more about her dad’s blessing because I knew how important family was to her. He ended up officiating our wedding. Step 0: Is It The Right Time? Should you be getting engaged? Should you be getting engaged to this person? Should you be getting engaged to this person at this time? If the answer to all three isn’t a hearty “hell yes!” then go make another big life decision: get a house, get a car… just don’t get engaged. The divorce rate is at an all-time low just north of 20%, so do your part to keep it that way. If you think about getting engaged and it isn’t something you’re sure you want to do, it isn’t the right time or the right person. That’s not to say it won’t ever be – but don’t rush it just because you’re feeling internal or external pressure. Step 1: What Do They Want? There are a lot of factors to consider: surprise vs. planned? Modest vs. grand? Public vs. semi-private vs. totally private? Ring vs. not ring? Diamond vs. not diamond? What season? How do you even begin to answer these questions? Easy! Talk to your partner. No, really: just talk to your partner. If you’re wondering, “but isn’t it supposed to be a surprise?” ask yourself: where did that idea come from? It’s certainly not deeply traditional – marriages were carefully arranged social and financial transactions until recent human history. And consider this: a study done by David’s Bridal found 22% of women would change something about their proposal. 15% – one in six – said they wish they could change their engagement ring. Communication is the key to avoiding regrets, second thoughts, or frustration. You’re gearing up for a lifetime of having, holding, and mutual support. Your job as a married person is to support your partner through thick and thin, good and bad… what better way to launch than by practicing solid communication? We’re against blindsiding your significant other. Don’t be the guy who gets rejected at Fenway Park while 20,000 Boston fans chant “She said no! She said no!” Because it happens. What have they always imagined for their engagement? Is it important to have an engagement token? What kind of location – public or private? What time frame feels right? Is there anything they absolutely DON’T want? You don’t have to get too specific – the point isn’t to plan your engagement like you would a wedding. But getting a broad sense of what will make them happy is key. It’s not a one-way street. If you’d always pictured proposing in a piazza in Perugia – say so! The idea of getting married came up spontaneously. I said something like, “I like ya alright… maybe enough to MARRY you!” We were both kind of taken aback, but it felt right. I knew she didn’t like surprises, so about a month later we went out for a nice dinner and talked about it. We agreed spring was a good time. We’re not super traditional but she definitely wanted to be asked. She picked out her exact ring – wood and turquoise from Northwood rings. Everything else she left up to me. We’re pretty private and we were also trying to save money, so I wanted to keep it personal and small but with a lot of meaning. I love surprises, so even though she knew it was coming, she didn’t know exactly when. I decided to propose on a hill overlooking Tulsa. It was our favorite walking spot and a place we always feel spacious. Many good conversations on that hill. The hike was tricky. I wanted to “spontaneously” take her for a hike after work but I needed to make sure she didn’t just come home on her own. So I made up some excuse for driving her to work – which I never do – but she just thought I was being sweet (ha!). I took off work and spent the whole day cooking: panzanella, tomato sauce from scratch, fancy pasta and fennel sausage. Desert was fresh fruit and her favorite local ice cream. I went to the dollar store, picked up a hundred or so tea candles, and placed them in clusters all around the house. Even though we were at home I wanted it to have a magical feeling. Step 2: Do They Want An Engagement Token? Engagement token, commitment symbol – it goes by various names, but the meaning is the same: does your partner want some thing that symbolizes your intention to get hitched? Most of us take it for granted: of course you get a ring, dummy! Engagement rings have a long and deep tradition. The ancient Egyptians presented one another with rings of braided hemp or reeds. Romans exchanged iron rings (and were the first to engrave them). On the other hand, for many cultures the ring is a small part of a much larger ceremony involving family, parties, and copious amounts of gift-giving. Some couples elect not to get a ring at all. Promise necklaces are becoming more common, for example, and it only gets less traditional from there. Two friends of Primer decided they really wanted something that reflected outdoorsy, adventurous life – so they got promise kayaks instead of rings. If you and your partner love to travel, perhaps a month-long excursion around the Greek isles is the right gesture. Just because a ring is a cultural expectation doesn’t mean you should assume you’re getting one. Start the conversation about engagement tokens and go from there. At the very least, you’ll score points for thinking out of the jewelry box. Maybe your partner will want to give you one, too! When I proposed (with a ring), my girlfriend presented me with an engagement token, too: a handcrafted Scandinavian hatchet with a line from one of my favorite poems carved in the handle. It blew me away. I wasn’t expecting it, but in the course of discussing what we wanted for our engagement I said it was unfair that just ladies got rings (only half joking). She listened – and I got a sweet hatchet! Do They Want A Ring? There are about 2 million weddings each year in the U.S. and estimates put sales of engagement rings at $5 billion a year. Chances are good they want a ring. Do They Want A Diamond Ring? 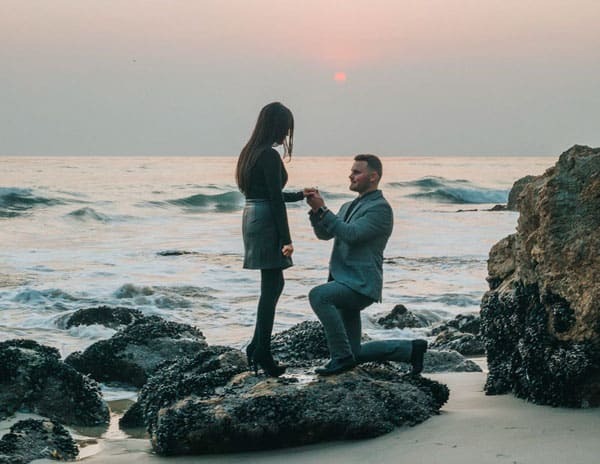 We’ve all heard the story about how a marketing campaign by the De Beers company created the modern “tradition” of diamond rings – almost from thin air. But hey – remember all that stuff about listening to your partner? If they want bling – and you can reasonably afford it – you’re going to want to educate yourself a little about what your options are, because diamonds can be a little overwhelming. At minimum, you’re going to want to know the four Cs: carat, cut, color and clarity. Here’s a good guide to the four Cs from Blue Nile, one of the biggest and most cost-effective online diamond and engagement ring retailers. One pro tip about diamonds that could save you some serious cash: one of the four Cs is clarity, which describes the amount and type of imperfections in a stone and gives a diamond its grade. Inclusions are internal flaws, while blemishes are imperfections on the stone’s surface. One thing to know about clarity is that a diamond’s grade can only be assigned at 10x magnification, meaning most imperfections aren’t visible to the naked eye – so don’t get carried away worrying that lower grade means your partner will notice tiny inclusions in their stone. Another trend in recent years is focusing your engagement ring search on non-traditional stones. Emeralds, sapphires, opals, and rubies are all totally rad. If they want input on the ring, throw it to your partner and see what they say! If not, do some snooping with their family and friends and see if there’s a stone that has special significance for them – either in their family history, or an expressed preference. Step 3: Should You Ask Permission Before You Propose? Asking permission is a thorny one. The answer really depends on three factors: How traditional are you and your partner? How traditional are your partner’s parents? How important is it for you to have a good relationship with them? Asking permission can imply your partner’s parents have ownership or control over their destiny – potentially irksome to your partner and awkward for the parentals. Luckily, there’s a fantastic way to sidestep the issue: don’t ask for permission. Instead, ask for a blessing. Asking for a blessing accomplishes the same thing without the old-timey connotations. It’s courteous, it signals respect, and – most important – it gives your partner’s parents the chance to ask something of you. By asking for a blessing they can transmit their expectations and hopes for your partnership. Sure, asking for a blessing is a formality. It’s also chivalrous. And it can be challenging. But consider this: You can’t undo NOT asking for a blessing. Our opinion: do it. You’ll be glad you did. She wasn’t sure she wanted to get married at all, but we definitely wanted kids, so marriage seemed like a good step. She didn’t want a diamond ring and didn’t want it to be in public. I knew I wanted to go somewhere to make it more special; I picked Puerto Rico because it was quick to get to for a long weekend and picked out an heirloom ring. I kept not finding the right moment and suddenly it was our last night. I decided to do it at sunset, so we went to a pier known for spectacular sunsets. As soon as we sat down a family rolled up behind us and started throwing rocks and bottles into the ocean. It totally killed the vibe. I stalled by playing Otis Redding’s “Sitting on the Dock of the Bay” on my phone. I remember we were drinking this high proof malt liquor fruit drink called Gasolina. I was super nervous. Step 4: How Much Planning Should You Do? Ask yourself: does this person want to entrust their finances, healthcare, housing and many other facets of adult life to someone who can’t plan a proposal? The answer is probably no. You should plan. Just like we’re not in favor of blindsiding your partner at a sporting event (or, even worse, over dinner at a restaurant… weak), we’re not in favor of too much spontaneity. You’re going to want to plan. In fact, go ahead and plan for a little spontaneity to ensure it goes well. The question is, plan what? After you know what your partner wants, make a plan for the date, location, and level of surprise. Those three factors determine your next level of logistics: does your plan call for accomplices, a photographer, a rain plan, and special touches (like music, flowers, etc.)? Do you want to have a party with friends and/or family afterwards? Here’s the thing about planning: what you both want should drive the prep, not what you think you should be doing. If you’ve made it this far, you can relax: you’re gonna do great. You’re already doing the work; trust yourself, do more research, feel confident. The most important thing is to explore who you are, who they are, and what you both want. Once you’ve done that, the rest will fall into place. What Are Your Proposal Pro Tips? Share Them In The Comments! Stillman Brown is a writer and TV producer who has created prime time content for National Geographic, Discovery, Travel Channel and many others. His interests span science & the natural world, personal growth, and food. He lives in Tulsa, Oklahoma. All great advice! My wife wanted an amethyst instead of a diamond and she still gets compliments on it years later. In my experience the thing that makes guys and girls most nervous when proposing is what they say to their partner when they get down on their knee. My best advice is to just say something from the heart that’s simple and sweet, then ask the question. It doesn’t matter what you say, so don’t stress over remembering a poem. Nine times out of ten no one will really remember what you say anyways. That’s not callousness either, there’re so many emotions and a kick of adrenaline that they really only hear the question. They’ll remember the events around you asking more than what you say, so don’t stress finding the absolute perfect thing to say when the moment comes.